» Can’t they see the conflict? Can’t they see the conflict? Oregon’s “first lady” as shown on the state government’s website. 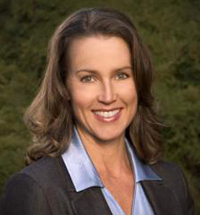 Oregon’s official state government website, www.oregon.gov, has a page devoted to “First Lady Cylvia Hayes” along with a description of a program she runs for the state, the Oregon Prosperity Agenda. It also includes her “full biography,” but as Oregon has found out in the last few days, the official version is anything but full. As Portland’s Willamette Week and others have reported, Hayes last year obtained contracts from three advocacy groups that paid her $85,000 for consulting work, even while she was pushing the groups’ green-energy agendas through her inside position with the governor’s office. Though she’s an unpaid “volunteer,” her position in the policy arena as proved by her state “prosperity agenda” makes her a public official. And that puts her private consulting contracts in a very shady light because of the law against public officials using their positions for private gain outside of their official salaries. Willamette Week also reported that in July 2013 the governor’s lawyer and chief of staff both recognized the conflict and tried to head it off by telling Hayes not to use state facilities or the “first lady” designation in connection with her private business. But she refused to go along, and the would-be prohibitions were canceled. Governor Kitzhaber now has called for a review by the Ethics Commission. Why didn’t he do that last year when his advisers raised the issue? And why can’t he himself see that it’s wrong to have a paid consultant for interest groups work in his office on state policies, especially if she’s his fiancee? As for the governor’s office’s “full biography” of Hayes, not only does it omit basic biographical details such as birth date or place, but it also leaves out her three marriages including, obviously, the one to an 18-year-old illegal immigrant so he could stay in the country, for which she charged $5,000. And naturally, there is no mention of the contract controversy involving her and the state Energy Department before her boyfriend’s third election as governor in 2010. I admired the younger Kitz when he walked out the door and declared the truth – Oregon is ungovernable. I like him less now that he’s a 67-year old man defending a less than honorable 47-year old live-in girlfriend. But the jeans, belt buckle and boots are still cool. I’m tempted to vote for him on sartorial splendor alone. I must admit, this is quite a political show that’s going on! Whether a conflict, or just an appearance of a conflict, those who have worked in government know that it really doesn’t make a difference. It taints the process. pure and simple. This is another example of where personal desires undo a political figure. Clearly, Cylvia wasn’t straight with Kitz, and it clearly calls into account her judgment both then and now. To complain that it wasn’t in the bio on the Governors site is a bit extreme to me, unless there is some hard evidence to the contrary. So far no one has produced anything beyond conjecture. On the other side, Dennis Richardson is a pretty poor candidate to be the governor himself. His policies and approaches pretty much want to take Oregon and America back to 1929. Even with this debacle, he is unlikely to sway enough voters away from Kitz to win. Why? Because Kitz’s foibles are mostly personal and not a result of his policies for Oregon. Do not forget the 4 “other sides.” There are 6 total sides on this hexahedron. Dr. K and his gal pal continue to make news on their own and it is a distraction away from the facts voters might want to focus on now. Repeating bad decision making is a disease in Mahonia hall. Oregon continues to have higher unemployment than the national average, for 17 years since Kitz’s first term. Linn County has 3300 fewer jobs than our employment peak in 2007, but Dr K says the economy is OK. When Dr. K ignored all, whistles, buzzers, alarms and reports that Cover Oregon was headed for a failure to launch and burn up more than $300 Million. His response, keep it going; ignoring pleas from the legislature to call a special session to shut it down now and that will waste another $20 million through January. It’s time to remove the gubernatorial warts and get back to a healthier, more economically vibrant state and that will take Dennis Richardson being elected Governor. The conflict is as obvious and identifiable as the chem-trials that are sprayed on us nearly daily. While her actions won’t likely kill us … the chemicals we are being sprayed with most certainly will.